VeriFone’s VX 670 GPRS is one of the smallest all-in-one wireless handheld payment devices in the world. This device can be setup to work off of a GPRS signal. Brought to you by our innovative Purpose Inspired Design program – with a focus on real world usage – the VX 670 changes everything. This supremely functional yet elegant device is tailored from top to bottom for a pay-anywhere, anytime environment. VeriFone’s patent-pending MAX ui design, with its stunning large, high resolution, white backlit display and large blue backlit keys, is easy to use under any lighting condition. A tapered design and ergonomically balanced midpoint help the VX 670 fit comfortably in even the smallest hands, and the rugged, drop-resistant, spill resistant case holds up to the most demanding conditions. The hidden integrated printer with its dual-tear bar, quickly produces receipts, is whisper quiet and simple to reload. Backward compatibility with existing payment applications minimizes training and gets you into new markets quickly. 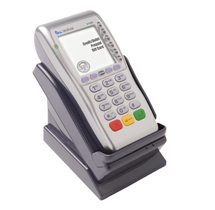 And VeriFone’s unsurpassed quality and reliability ensure that the VX 670 is an excellent investment going forward. Note: Charging base sold separately.